There are paint ball equipment rentals available at Action Packed Paintball for those that don’t have their own equipment. The standard rental package includes a semi-automatic Tippman Model 98 paintball marker, hopper, mask, barrel cover, triple pod carrying pack, and compressed air tank. There is free, all day air fills with the package as well. Individuals can bring their own paint ball equipment as well. However, they cannot use their own paint. Paint is available for purchase before going out to play. Action Packed Paintball Games is a great local place to play paintball for individuals and groups in Minneapolis. It is an outdoor paintball park that has 8 different fields to play on. It is even open during the rain and only closes down with really bad weather. For groups that are going to play, need to at least have a minimum of 2 people. There can be up to 150 or more people playing at a time in a group. This is a great place to have birthday parties, bachelor parties, youth group, or other types of groups. Once you have figured out if you are bringing or renting your paint ball equipment, it is time to set up a reservation. Reservations are best for groups, so they can ensure a spot for the day they need. 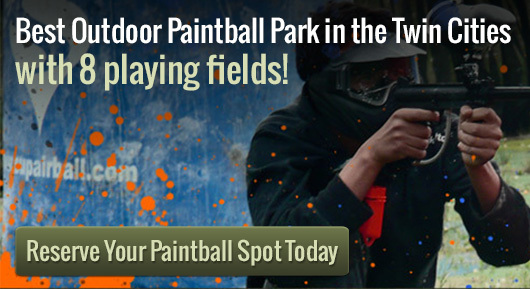 Reservations can be made by calling Action Packed Paintball Games at 952-492-6776. For groups or individuals who want to play paintball with other people, we offer walk-on play sessions. This is great for those that are learning how to play or don’t have enough players. Walk-on play is only available on Saturdays and Sundays.